The first survey of historic properties conducted by the Teton County Historic Preservation Board began in summer 1997 and continued through until summer 1998. The object of this survey was to identify select resources of potential historic significance in the county, with only a few located in Grand Teton National Park. The following is taken from the report I submitted with the survey forms. The forms have not been digitized yet, but in time they hopefully will be. I placed a copy of the complete study, Jackson Hole Palimpsest: A Survey of Historic Buildings in Teton County, Wyoming 1997-1998, in the Jackson Hole Historical Society's collections. The inquiry into the past is a task that holds great significance and potential, given the utility of history as a guide to decision-making in the present and future, as a means of understanding the circumstances of our own existence, and as a way of determining who we are and where we are going. But the study of history especially has a deep meaning for the citizens of a community who have participated in, pushed against, or just watched or even who have only learned second-hand about how the place where they live took the shape that it now holds. History at the local level is the history of life and the world written in comprehensible terms. It is not, however, an obvious history or a history the meanings of which are self-evident. For those who may be new to the community or whose experience in the place has been otherwise limited, and for those whose experience and perspective on the development of the area has been restricted in some way, the local history may even be misunderstood. Certainly as generations pass and as remnants and reminders of earlier times fade also, so too does the ability of the past to become a meaningful part of people’s lives loses force and immediacy. It thus requires a conscious and purposeful effort to reclaim the past before it is completely gone and covered or just forgotten. The current study, contracted by the Teton County Historic Preservation Board, is an attempt to gather information about the past in Jackson Hole. 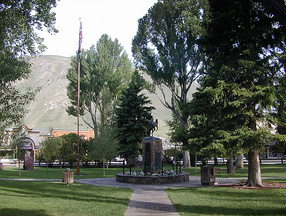 The specific object is two-fold: (1) to provide some information about some sites in the county so that a beginning will be made in recording and understanding some of the special history of Jackson Hole, and (2) to encourage, by way of example and specific information, the further study of these and other sites in an ongoing inquiry into Jackson Hole history. The notion of palimpsest is useful as a metaphor for the current investigation. A palimpsest is an old document that has been written and revised, perhaps several times, with some of the words and lines of the original letter or other communication obscured, sometimes crossed out, sometimes modified, sometimes even erased, and sometimes the message leaving just a slight indentation in the paper. Of course, while these words and sentences remain hidden on the paper, all about them are the replacements, the modifications, the words and thoughts that took their place. The task is to find the clues that reveal the thought originally expressed so that it will not be forever obscured by what came later. (Imagine the detective trying to discover what was written on a piece of paper by examining the paper that was beneath it for possible indentations and ink seeps.) Those clues, those signs of earlier intentions and circumstances are there. They just need to be found and to be interpreted. So too with local history. The marks of the past are around us, but without careful attention they will also be overwritten and relegated to the forgotten corners of memory. With focused attention, however, they can become not just picturesque aspects of a very special landscape but integral parts of our landscape, awareness, and life. In some ways, bringing those features out of the shadows and into the light may be the most important palimpsest. The Teton County Historic Preservation Board and other notable volunteers undertook what is known as a “windshield survey,” something more substantial than the name may suggest. The participants collectively and individually listed and studied sites of possible historic significance in the valley, aside from those places owned by the federal government, since the federal government has statutory responsibility for recording and preserving those sites it manages and following specific procedures to prevent any compromise of the integrity of those sites. The results of that survey were then used by the present contractor, who also conducted a survey, and then began inquiring into specific locations and structures. By conducting research in various published and archival sources and also in interviews with property owners and other knowledgeable people, the current report was produced. This report is not intended to be, nor is it possible to be, a complete and comprehensive list. Given that limitation, indeed, the effort of the contractor was to identify and explore sites that reflect the enormous diversity and complexity of experience in Jackson Hole. So this is not just an effort to commemorate the first settler or the first dude ranch or the first of any category, but an effort to understand how various sites reveal aspects of our past. Thus the sites recorded and interpreted here include those from different parts of the county, with different roles and associations. They include private in-holdings from the north inside the Grand Teton National Park to properties in South Park. They include cattle ranches and dude ranches, tiny homesteader cabins and substantial spreads. They include buildings that are nearly gone or at least are no longer habitable. They include sites associated with outlaws and political leaders. They include places associated with the rich and powerful and the meek and powerless, with those who have triumphed grandly in life with the fulfillment of their dreams and those who found instead disillusionment and despair. They include the ways in which the valley has been transformed over more than a century in the small matters of living life on a day-to-day basis—the changes in transportation, the marketing of cattle, the coming of electricity, the emergence of mosquito control, the putting up of hay, the way the Great Depression and wars reached their tentacles into the valley to be experienced differently by different people, the basic pattern—and exceptions to that pattern—of migration to the valley, the rise and decline of dude ranches and the rise of the modern tourism industry, the debate over the role of government in the valley, and more—all of which add up to enormous changes locally. Perhaps the fundamental theme has been the increasing integration of Jackson Hole into a wider world, a more cosmopolitan environment, and a more fluid population. The other side of that, of course, has been the loss of isolation that formerly defined life in Jackson Hole with residents tallying up the gains and losses of each step according to their own individual lights and assessing the progress and decline by their own experiences. When others, who have not had to experience this history first hand, can still learn from it and make their own assessments from the marks and features on the land around them, the promise of the palimpsest will have been fulfilled and the journey toward better understanding and appreciation will have begun. The following sites have been included in this year’s survey of historic sites. There are many more to be surveyed in the county and many of them will be in the same order of importance as these, and some will be more important. There is also more information to be gathered about these sites. Any corrections or additional information would be appreciated by both the author, Michael Cassity, and the Teton County Historic Preservation Board. Finally, these sites are on private property. They are not open to the public. They are private homes and businesses and should be treated like you would want others to treat your home and business—with respect. Moreover, to encourage more people to participate in surveys like this and to share information about their homes, businesses, and families, it is imperative that we honor their own privacy and routines of life.